If NASA's 2009 Mars Science Laboratory (MSL) reaches the redplanet's surface in one piece, the agency will owe a debt of gratitude to theSikorsky S-64 Skycrane heavy-lift helicopter. Like its namesake, NASA's Sky Crane carrier platform willhover above its drop site--albeit with retrorockets rather than rotor blades--andlower its payload, the compact car-sized MSL rover, to the surface using awinch and tether. As soon as the rover is ready to roll, the tether connectionwill be severed and the Sky Crane will fly off and crash land a short distanceaway. The MSL will be the first NASA mission to employ thisplanetary landing scheme, but it might not be the last. Adam Steltzner, leadengineer for MSL's entry, descent and landing system at the Pasadena,Calif.-based Jet Propulsion Laboratory, said the Sky Crane approach makes sensefor any destination where the terrain is not well understood or when it isespecially important not to unduly disturb the landing site. Early lunar landermissions are one possible application, Steltzner said. Mars sample returnmissions are another, he said. 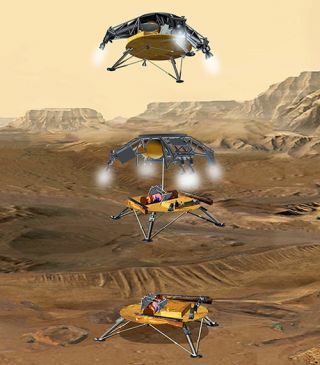 Steltzner said NASA settled on the Sky Crane approach in2003 after concluding that the 775-kilogram nuclear-powered MSL was too massivefor the airbag landing that worked so well for the 1996 Mars Pathfinder and the2003 Mars Exploration Rovers. Another possibility was a three- or four-legged landerassisted by parachutes and retrorockets, he said. But after the failure of the MarsPolar Lander, which employed that mode, NASA was open to trying something alittle different, he said. NASA lost contact for good with the Mars Polar Lander Dec. 3, 1999, once the probe began its descent through the martian atmosphere. Asubsequent investigation concluded that onboard computers probablymisinterpreted the sudden jolt of the lander's legs deploying as the actuallanding and ordered its descent rockets shut down--even though the craft wasstill about 130 feet (40 meters) above the planet. Net result: a fatal80-kilometers-per-hour impact with the martian surface. The experience led NASA to shelve a similar lander, the MarsSurveyor 2001, and revert to airbags for the twin Mars Exploration Rovers,Spirit and Opportunity. NASA studied using airbags to bounce the $1 billion MSL to asafe landing, but concluded that the challenges posed by the rover's size wereinsurmountable. "The airbags simply could not get the job done for the MSLrover," he said. "They just don't scale." NASA has not abandoned the concept of self-contained landersusing retrorockets and shock-absorbing legs. The Mars Phoenix Lander, astationary science platform slated to launch in August 2007 toward Mars'northern polar plains, will employ this approach, for example. NASA made anumber of changes to avoid a repeat of the Mars Polar Lander debacle. ThePhoenix Lander, a Scout-class mission, was pulled together largely from MarsSurveyor 2001 hardware and spare Mars Polar Lander instruments. Steltzner said landing on a set of legs is a trickyproposition even if everything goes right. For starters, he said, there arestability issues galore as a top-heavy lander approaches touchdown, itspropulsion system on notice to shut down a second or so before the legs makecontact with the ground. Failure of any of the thrusters to cease firing at just theright time could send the lander hopping across the surface, as happened withNASA's Surveyor robotic lunar lander in 1967. Getting a rover off a legged lander after touchdown posesadditional challenges, Steltzner said. Ramps are customarily used, but there isno guarantee that the martian terrain and an imprecise landing will notconspire to deny the rover a safe path to the surface. On the 1996 MarsPathfinder mission, for example, only one of the landing platform's two rampsopened onto a clear path for the tiny Sojourner rover. NASA could have just aswell found both paths blocked. For the MSL mission, Steltzner and his colleagues decided tobypass some of those issues by putting rover directly onto the surface. Like NASA's two stationary Viking landers of the 1970s, theMSL will rely on parachutes to slow its fall before the eight Viking-classthrusters on the Sky Crane landing system ignite at 1,000 meters above thesurface, providing a controlled descent. At 35 meters, the Sky Crane will beginlowering the rover on a tether--similar to the way the Sikorsky S-64 delivers underslungpayloads--as it continues its descent. When the rover's wheels touchdown, thetether is severed and the Sky Crane platform flies off to land 500 meters to1000 meters away, Steltzner said. While some scientists would like NASA to put instruments onthe Sky Crane, essentially transforming it into a stationary lander, Steltznersaid that is not currently in the plans. As it stands, Sky Crane would have noonboard capability to process and transmit data once it has dropped off the MSLrover, which supplies the brains of the operation. NASA has been developing the Sky Crane concept with some ofthe $80 million invested in MSL technology since 2002, Steltzner said. Thosetechnologies include a landing radar and hazard avoidance system that should bebetter than any NASA has ever flown, and more powerful, throttle-able versionsof Viking's hydrazine thrusters, he said. Steltzner said NASA has a vigorous validation and test planmapped out for every element of the Sky Crane landing system. The agencyultimately must rely on a combination of integrated hardware testing andsimulation to feel confident that the system will work in the only environmentthat counts--Mars. "That's par for the course in this job," Steltzner said. "Wenever really get to do a full end-to-end test of any of the [entry, descent andlanding] systems for Mars because we are not on Mars. This one is not anydifferent."